Water may be common on planets outside our solar system, according to international scientists. The researchers looked at data from the exoplanet hunting Kepler Space Telescope, and found that the size and mass of many of the known planets means they could contain as much as 50 per cent water. This is much more than the Earth’s 0.02 per cent (by weight) of water content. 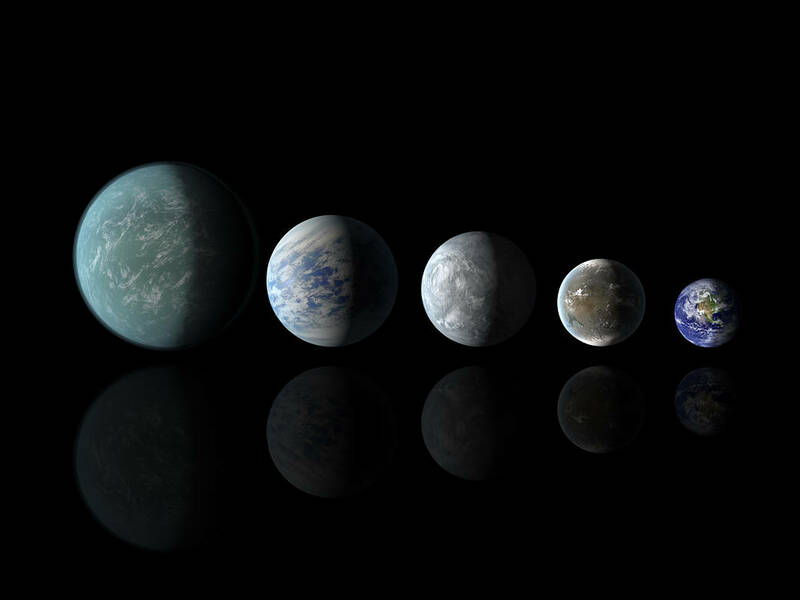 The researchers say about 35 per cent of all known exoplanets which are bigger than Earth should be water-rich. What has been found? That the known masses and sizes of many exoplanets of two to four times the size of Earth can be explained by large amounts of water. Why is it important? Water has been implied previously on individual exoplanets, but this work concludes that water-rich planets are common. This bodes well for planet formation of Earth-like planets with water and the search for life beyond our Solar System. The 1992 discovery of exoplanets orbiting other stars has sparked interest in understanding the composition of these planets to determine, among other goals, whether they are suitable for the development of life. Now a new evaluation of data from the exoplanet-hunting Kepler Space Telescope and the Gaia mission indicates that many of the known planets may contain as much as 50% water. This is much more than the Earth’s 0.02% (by weight) water content. Scientists have found that many of the 4000 confirmed or candidate exoplanets discovered so far fall into two size categories: those with the planetary radius averaging around 1.5 that of the Earth, and those averaging around 2.5 times the radius of the Earth. Now a group of International scientists, after analyzing the exoplanets with mass measurements and recent radius measurements from the Gaia satellite, have developed a model of their internal structure. “We have looked at how mass relates to radius, and developed a model which might explain the relationship”, said Li Zeng. The model indicates that those exoplanets which have a radius of around x1.5 Earth radius tend to be rocky planets (of typically x5 the mass of the Earth), while those with a radius of x2.5 Earth radius (with a mass around x10 that of the Earth) are probably water worlds”. “This is water, but not as commonly found here on Earth”, said Li Zeng. “Their surface temperature is expected to be in the 200 to 500 degree Celsius range. Their surface may be shrouded in a water-vapor-dominated atmosphere, with a liquid water layer underneath. Moving deeper, one would expect to find this water transforms into high-pressure ices before we reaching the solid rocky core. The beauty of the model is that it explains just how composition relates to the known facts about these planets”. Li Zeng continued, “Our data indicate that about 35% of all known exoplanets which are bigger than Earth should be water-rich. These water worlds likely formed in similar ways to the giant planet cores (Jupiter, Saturn, Uranus, Neptune) which we find in our own solar system. The newly-launched TESS mission will find many more of them, with the help of ground-based spectroscopic follow-up. The next generation space telescope, the James Webb Space Telescope*, will hopefully characterize the atmosphere of some of them. This is an exciting time for those interested in these remote worlds”. “It’s amazing to think that the enigmatic intermediate-size exoplanets could be water worlds with vast amounts of water. Hopefully atmosphere observations in the future—of thick steam atmospheres---can support or refute the new findings”. *JWST is the James Webb Space Telescope, which will be the successor to the Hubble space telescope. It is due to be launched in 2021, see https://www.bbc.com/news/science-environment-44631661 for background. This press release is based on work presented at the Goldschmidt conference, Boston, Abstract Growth Model Interpretation of Planet Size Distribution, see notes for full abstract.